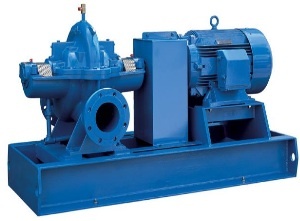 Split case pumps are used in large capacity general service pumping. They are available in single stage or multi-stage configurations, horizontal or vertical mount designs and electric or engine drives. Split case combine mechanical simplicity with sophisticated hydraulic design and are popular in a variety of commercial and industrial applications. Pump Express customer service agents are standing by to provide technical assistance, price quotes or to answer any questions you may have regarding the split case pumps we stock and sell. Call Our Toll Free Number 1-800-298-4100.